It’s your first date in a new city. The prospect of a night out on the town, and, hopefully, a new love, can be thrilling, but first, you’ll have to answer the question of what to do. Sometimes the tried-and-true dinner date can feel a little stale, especially if it’s a second or third (or twentieth) date. And why not take the opportunity to explore the city while you’re at it? 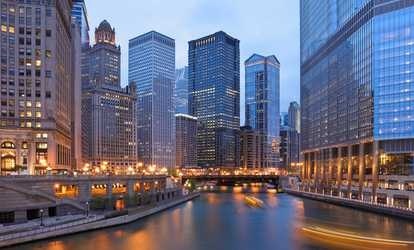 Whether you’re looking to make a good first impression, taking the first steps toward a whirlwind romance, or just looking for a nice day out with your spouse, there’s plenty for couples to do in Chicago. But before you play twenty questions with your date to find an activity from the myriad options, here’s a few of our suggestions. Second City, the iO Theater, Chicago Improv Festival--for spots to catch Chicago’s comedy scene, the list goes on. Catch touring comics and local staples at Chicago’s Laugh Factory, or check out new acts at the recently-opened Under the Gun theater. You might even catch comedy superstars Kumail Nanjani or Hannibal Buress at the restaurant-turned-comedy club the Lincoln Lodge. If you and your date are interested in taking center stage, Second City offers Q&A, workshops and special events to learn tricks of the trade. Maybe you’re a Chicago native, or maybe you’re new to city. Either way, catching a game at Chicago’s Wrigley Field is a necessary stop at least once. Take your date out to the ball game (and preferably a Cubs game) or bond over the Bears and a few beers. After the game, test each other’s skills and sportsmanship with bowling at Southport Lanes, or, for a ‘80s or ‘90s kid throwback, an arcade showdown at Headquarters Beercade. If you and your date are looking to get a little crafty, or need a little color added to your date night palette, one of Chicago’s BYOB paint studios or a local bar’s Paint Nite might be your next big idea. For other things to do in Chicago, uncork a bottle and create a masterpiece at Bottle and Bottega, or unleash your inner Picasso with an Arts N Spirits event. Keep an eye on the calendar, and if you’re lucky, you might break out your Bob Ross skills at your local bar. After your date, you’ll have your painting as a souvenir! Channel a little Ferris Bueller with a day out to the Art Institute of Chicago. Stroll through their permanent collections, take in a new exhibit, or go for Baroque with one of their Free Thursday evening events. Take in a little culture, and then maybe dinner at the Museum’s third floor restaurant and bar, Terzo Piano. If you prefer tranquil garden strolls over playing hooky at the art museum, visit one of the Chicago Botanic Gardens’ 27 gardens, or for a scenic happy hour, take your date to the Gardens’ Orchid Show happy hour. Even for the most seasoned Chicagoean, it’s worth seeing the Windy City via river. Take a romantic sunset or evening cruise with your date, complete with dinner and dancing. Or, for casual day out, try a boat tour to brush up on your Chicago landmark knowledge. If you’re looking to have an adventure, take a kayak or a paddleboard from North Avenue Beach. Paddle by the city at night and see the city lights reflect off the water, or take a class for a weekly date activity. Breakfast may be the most important meal of the day, but brunch is undoubtedly the best. Wake up early for dim sum at Cai, then walk off your meal hand-in-hand around Chinatown. For a great boozy brunch, Wicker Park’s Lokal offers $10 bottomless mimosas and Bloody Marys, and for a premier dining experience, grab a reservation for two at the Michelin-starred Band of Bohemia for some beignets, hot chocolate and duck confit hash. What could feel like a ho-hum date is saved by Chicago’s variety of dinner spots, supper clubs and cocktail bars. Get dressed up in your best Prohibition-era garb and head to the Green Mill Cocktail Lounge, infamously known as Al Capone’s favorite bar for jazz and a pre-dinner apéritif, or head to the Fountainhead for a fireside whiskey and intimate conversation. For dinner, cozy up with your date at Geja’s Cafe for a four-course candlelit fondue dinner. If it’s a special occasion, be sure to order flowers for the table at Geja’s website. And for a classic Chicago experience, hoof it out to one of the city’s many trivia nights, or to an indie flick at the Music Box Theatre. Make sure you check out Widest for more travel resources!